With a change in government regulations, the modern toilet has gone down to a 1.6 gallon per flush type of function. This has caused many toilet designs that were once great to be less than such. It has become more important than ever now to find the best flushing toilet to make sure residue doesn’t build-up in the bowl, requiring frequent cleanings. How do you find the best flushing toilet? Sometimes all you need is a little extra information. The best chart of flushing toilets will let you determine which toilets are winners… and which toilets you should just flush from your memory. 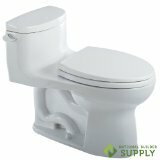 What Makes For a Good Flushing Toilet? A good flushing toilet is going to have a lot of fast water movement today because it isn’t using a lot of water. The rapid movement of the water will help to clean the bowl, but only right up to the water line. That means a good flushing toilet must also have a consistent level of water to be beneficial to a home. The best models will also have a large glazed trapway so that waste can easily pass through the toilet. Look for glazed trapways because this will prevent waste from getting caught, drying out, and then emanating a wonderful odor into the bathroom with every flush. What Are the Benefits of Having the Best Flush? The primary benefit of having the best flushing toilet is that you’ll be able to have a quality bathroom experience without needing to use a lot of water. Some toilets can flush with less than 1 gallon of water today, which means you could save about $100 per year on the average water bill! This is almost 33% less than the current EPA WaterSense requirements for toilets, which is a maximum of 1.6 gallons per flush. These ultra-low water usage toilets install easily on a standard rough-in and are durable enough to withstand many thousands of uses. Trying to get the perfect shape for the perfect flush! How do engineers create the ideal flush? Watch this video. 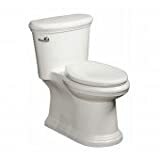 If your new toilet only flushed 5 times per day at 1.28 GPF you would save over 4,000 gallons of water per year! Compared to an older 3.5 GPF model, that is pretty amazing, right? Although there are good toilets that have their trip lever on the side of the tank, there are often fewer working parts on a front mounted lever. There is also less stress on the internal mechanism with most front tank trip levers. The best are chrome plated to give the lever an extra level of durability. 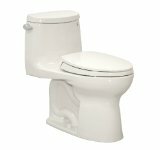 The best flushing toilet also provides a comfortable experience to people of all shapes and sizes. Some bathrooms may benefit from an elongated toilet bowl, while others may prefer the rounded toilet. Either way, look for quality components in the design so that you get the best flush possible. What Are Some of the Common Problems With the Modern Toilet? Flushing is a fundamental component of the waste disposal process, so compromising on this feature of a toilet isn’t a great idea! The biggest problem is having waste or toilet paper land above the water line of the toilet. This is certain to cause a mess because the water pressure, which is required to be less than 5 pounds, just isn’t good enough to get rid of it for a residential setting. A secondary problem with toilets today is odor. Although most trapways are 2 inches in size, the modern toilet can’t always break up the waste to a small enough size to accommodate the trapway. You can counter this by looking for toilets that are specifically designed to reduce waste size as it travels through the bathroom fixture. There’s also the issue of condensation on a toilet tank when the environment gets hot and humid in the bathroom – like when you take a shower. Look for toilets that have a liner within the tank portion of the toilet to remove this issue. Some toilets don’t have tanks, which makes it a moot point! How Do You Find the Best Flushing Toilet? The first stop on your journey should be at our comprehensive reviews. We take a fact-based look at the flushing process so that you’ll be able to see the toilets that work and the ones that need some help. Take a close look at the features of each toilet in particular because you’ll be able to see if a manufacturer has included waste dispensing technology to assist with every flush! You’ll also want to look for a toilet that has a reduced noise. Many of today’s best flushing toilets also tend to fit into a category all their own called “loudest toilet possible.” Not every good toilet is a loud toilet, however, so look for a fixture that has sound reduction technology incorporated into it so you don’t have to proudly announce to the world that you’ve successfully gone to the bathroom! You’ll also want to look at how fast the water drops through the canister flushing valve of the toilet to evaluate its flushing ability. A 4 inch valve, for example, will drop water into the bowl at twice the speed of a standard 2 inch valve. They may make for more water noise, but it also generally means a better overall flushing experience. What Are the Basics of Plumbing a Good Flush? Installing a the best flushing toilet is a pretty easy task for most bathrooms, but it is tricky enough that you may wish to have a plumber come out if you haven’t done any plumbing work before. The standard rough-in, or the measurement from the waste outlet to the baseboard of the wall, is 12 inches today. Older homes might be 10 or 14 inches, however, which means you’d better measure if your home was built before the year 2000. You’ll also want a firm anchor for your toilet because: A) most toilets weigh 100 pounds or more; and B) it must support your weight and the various weights of your household repetitively throughout the day. This means you’ll need to do more than just anchor your toilet to the subflooring like you’d anchor a picture to a wall. Make sure your toilet is supported by the studs in the floor and you’ll have a better, safer toileting experience. The height of the toilet you choose also play a role in how the toilet is plumbed in. Higher toilets tend to be a little more difficult to install simply because there is more mass to them. If you’re looking for an ADA compliant toilet seat, which means one that is at least 16.5 inches high, then you’ll want to enlist some help installing this waste-eating beast! What Are the Prices of the Best Flushing Toilets? The best flushing toilets can be found on Amazon today for below $300 in most circumstances if you’re willing to have a basic toileting experience. This is perfect for those who just want a solid fixture without any bells or whistles. Advanced models can be above $1,000, but you’ll get automatic features and potentially heated toilet seats for that price. The average price for the best flushing toilets is just above $450. This toilet can act as your primary toilet if you need it to do so, but it is a better option for that spare toilet that you need to throw into an empty, unused space to add to the overall value of your home. It weighs just 62 pounds and can be connected to a ground fault interrupter circuit, so the flexibility you have with it is best in class. It can be rotated a full 360 degrees to accommodate virtually any installation arrangement and the best part is that this toilet is completely electric. Part of the reason why the TOTO Ultramax works so well is that it has improved the design of both the trap and the flushing valve. 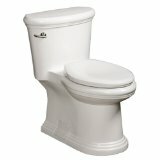 The primary feature that we loved about this specific toilet is the G-Max flushing system that is included with it. This makes the flush more quite and powerful, enough that it is considered “commercial grade performance”. You also have a flushing valve that is 3 inches in size, giving you extra flushing power over today’s standard, entry-level toilets. The trap is also fully glazed, and a wider 2 and 1/8 Inch computer designed. The SanaGloss glaze finish allows for super smooth clean flushes. 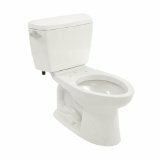 We can see why this is a top selling best flushing toilet. It has a popular high profile design and an elongated seat pattern. The primary advantage of owning the Danze Orrington is the smoothness that you’ll receive with each and every flush. The bowl on this toilet has a fully glazed trapway so that movement through the toilet is as effortless as it can be. It also resists residue and stain buildup deep within the toilet that can often result in bad odors emanating from this bathroom fixture. With the three inch flushing valve, you’ll get one of the fastest and strongest flushes you can get on the market today at this price point and with this level of water usage. Do you want a toilet that will give your bathroom a stately appearance? Designed with a powerwash rim and an elongated siphon for better water movement, stains don’t have a chance of existing when you flush this toilet! This toilet has the ability to flush up to 1,000 grams of solid waste with every flush show you won’t have to worry about leftovers in your bowl and you’ll be able to save at least 20% of the water that you use with every flush thanks to this toilet using just 1.28 gallons per flush. Overall it will provide you with a strong, elegant experience every time! 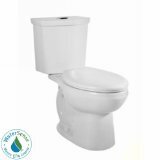 Invest into the best flushing toilet for your home today and not only will you save money by reducing your water consumption, but you’ll save yourself from a lot of double or triple flushes too. Use the reviews to your advantage, select the best for your home, and enjoy the fact that you’re saving the environment a little bit with every flush! Not looking for just the best flush? Take a look at our overall best toilets over at this page.